No one wants their parents on their Facebook, Twitter, Instagram, or any other social media site they might be busy embarrassing themselves on. They surely don't want to see pictures of you on the verge of consciousness every night and you certainly don't want them posting embarrassing things in a public forum. Origami keeps things private, so everyone wins. 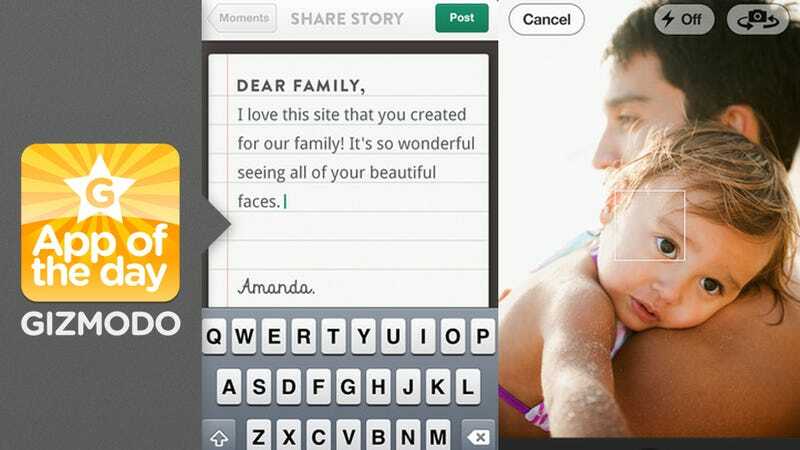 Lets you share photos, albums, videos, and text messages with other members of your designated family. In addition to being an app, you also get the domain of [yourfamilyname].origami.com, where you get all the functionality of the app versions. Both the mobile app and the website have the same, familiar timeline-style feed. It will even send you a daily newsletter (if you so choose) with all of your family's latest happenings. Not only are parents or grandparents joining social media sites often a point of contention, but there are some images, videos, and memories in general that you want to make sure stay within your family. And it doesn't really feel like adding an extra burden onto your social media plate, because for the most part (especially if you're the type of family that would use this app), you're already sharing these things anyway. Origami just simplifies it. However, the service is $5 a month, and with all the free—even if less convenient—options out there, it's probably not worth it for people who don't regularly keep up with their family online. But if you've got a family that loves and/or needs to use the internet to stay connected, this is a wonderfully private, easy way to do it.